LOS ANGELES — Before becoming one of the fastest growing global fashion brands on the internet, MVMT began as a small crowdfunded project launched by two college dropouts, Jake Kassan, 26, and Kramer LaPlante, 26, with a risky dream. To help turn their watch and accessories company into a multimillion dollar movement that social media creators now (literally) jump out of planes for, two more youthful dreamers with equally risky creative strategies joined the crew: Blake Pinsker, 26, and Spencer Stumbaugh, 27. Since its launch 5 years ago, this growing team has sold over 1 million watches spanning over 160 countries with no outside investment. This week, the company officially hit its 1-million-follower milestone on Instagram. The grit and against-all-odds psychology that guided this young team of entrepreneurs is now the defining spirit of MVMT as a larger idea. Due to their grassroots authenticity, their small team of creatives at their headquarters in Los Angeles has been embraced and bolstered by thousands of digital nomads, content creators and millennial adventurers around the world who have latched onto the company's overarching mission and backbone: to "live life on your own terms" and to "do everything against the traditional way." 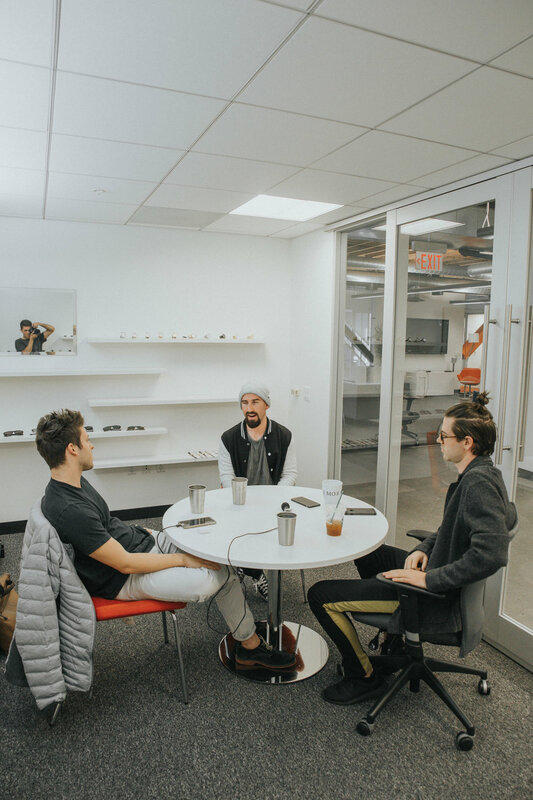 Left to Right: Jason Goldberg, President of GoVyrl, Inc., Blake Pinsker, Director of Marketing of MVMT, Spencer Stumbaugh, Creative Director of MVMT. Photo: Stew Clementz. "Creativity is how businesses differentiate themselves," Stumbaugh, MVMT's Creative Director said. As the first direct-to-consumer watch brand on social media, MVMT did everything against the norm to establish itself. Stumbaugh said their creative strategy began as "deciding to promote style without breaking the bank," and then authentically curating the message of that brand. So, how did Kassan and LaPlante, two "broke college kids," disrupt and conquer an industry so saturated with millions of e-commerce watch companies and so established with the world's most enduring luxury brands? A mix of creative risk, savvy social media marketing, and an entourage of brilliant social media creators. "Jake [Kassan] was the epitome of a great leader because he really let us [Pinsker and Stumbaugh] fail and build the brand with what we envisioned and expand our wings," Pinsker, MVMT's Director of Marketing said. "When we used to tell people that we were going to build a business through social media, we would get laughed at," Pinsker continued. "We almost had a chip on our shoulder early, and we still do, because we really wanted to prove people wrong. We saw what was going on with social media, and we wanted to use that to build our brand and identity." This foresight manifested in a series of Instagram hashtag campaigns, utilizing the power of social media's free circulation space when their own marketing budget was still nascent. For anyone who purchased a MVMT watch, their product was packaged with an insert to introduce a new social media competition every month. Whoever created and posted the best photo or video content with their new MVMT gear on Instagram (which was tracked by the hashtag #jointheMVMT) would receive a gift card or other prizes. This not only allowed MVMT to curate an entire Instagram feed of organically-crafted content, but it also established a lifelong relationship with their audience of young, ambitious and passionate creatives. Their socials began to grow at exponential rates. Now, their flagship Instagram account is in the big leagues with 1 million followers. The fostering of such a large and loyal community resulted from MVMT's creative team building their identity around a lifestyle most millennials and Gen Zers dream about — a brand "for the kind of modern day Renaissance man or woman who is adventurous, loves fashion, loves travel and is inspired to go out there and do everything," Stumbaugh said. This, he added, is how their brand became to be solidified. "Another key part is understanding what the market resonates with," Pinsker echoed. "The big part of branding is understanding what you want to portray and how you want to inspire people... A lot of people make the mistake of having a subjective opinion of what their brand should be, but they don't listen to their market or their fans or customers." For MVMT, aligning the values of their own mission with the values of their audience helped them establish a bond of longevity and trust with their customers. If their goal is to promote a lifestyle that is in equal-ways fashionable, adventurous and affordable, then they make sure to collaborate with those who live out these intrinsic principles. "Early on, we couldn't afford our own photoshoots," Pinsker said of the importance of the creator space. "We also realized that anything that looked like a magazine, editorial shoot with paid models and a fake setting did not resonate [with our base]. That was the organic nature of Instagram and marketing to millennials. They don't want to see something fake. They want to see something real." Reaching out to creators and social media personalities who truly embodied the MVMT lifestyle became a primary focus for the budding brand. From smaller-scale, undiscovered creatives to huge names in the space such as Rory Kramer, Sam Kolder and Matt Komo showcasing MVMT gear while cliff diving, scaling skyscrapers, jumping out of helicopters, and traveling the farthest reaches of the world helped build the heart of their identity and invigorate a rapidly-growing social media community. "Starting out, we started relationships with creators by exchanging a watch for a picture," Pinsker said. "Before we knew it, we had this whole network of creators working with us that loved the brand and loved getting featured on our account because it was good exposure for them. That content is now what you see as the foundation of our brand, even though it's from hundreds of people around the globe." With all the clutter and noise on social media, fighting for and gaining the attention of large amounts of people became a huge success for MVMT. Now, as a globally-established fashion brand, the team still thrives by collaborating with the creator community and by staying ahead of the social media curve, especially as they move into the ballpark of a $100 million company. "We want to continue sharing content from creators who are doing amazing stuff that we know the rest of the world would enjoy, and that ultimately happens by staying on top of our social media touch points at all times," Stumbaugh said. "It’s the little things, the little details, the little extra effort that goes a long way... like always replying to our fans and evolving with different, changing platforms. That’s my advice for sustained success for any brand, and that's our goal as a business — engage on as many different touch points, whether it’s email or socials... We definitely preach it, and think it’s the most important thing to do besides share awesome content." Trying to sell something? How to PITCH it.